Dr. Harry Josifidis is the first to admit that New York health regulators do not like him and they've gone to great lengths to put him out of business. In 2001, New York’s Board for Professional Medical Conduct suspended the Queens urologist's license for performing unnecessary surgeries without patients' consent. He said all the surgeries were medically valid. In 2010, the board voted to revoke his license for defrauding insurance companies. He said regulators misunderstood his business arrangement. But while Josifidis appealed over two years in state court, he continued to prescribe under the Medicare Part D program. Josifidis’s state appeal was ultimately denied, but not before federal taxpayers paid for $61,000 worth of his drugs through Medicare. Charles Ornstein, an investigative health reporter at ProPublica, has compiled a searchable database of prescriptions written under Medicare Part D. As he analyzed the data, he found flagrant examples of doctors who had been severely disciplined by states, and yet the federal program continued to fund their prescription writing. The I-Team worked with Ornstein to find other problem doctors prescribing drugs on the Medicare dime. That includes doctors like psychiatrist Anastasia Kucharski. After she lied about having malpractice insurance, Massachusetts revoked her license in 2010. And yet in 2011, Medicare paid about $73,000 for Kucharski's prescriptions in New York. “I did something wrong," she added. "I should not have been prescribing, however the prescriptions were valid." In 2008, Dr. Priscilla Ilem was disciplined by New York health regulators and promised never to practice in the state again. She did however continue to practice in New Jersey, prescribing Medicare drugs worth more than a half million dollars, despite her serious disciplinary history across the Hudson River. 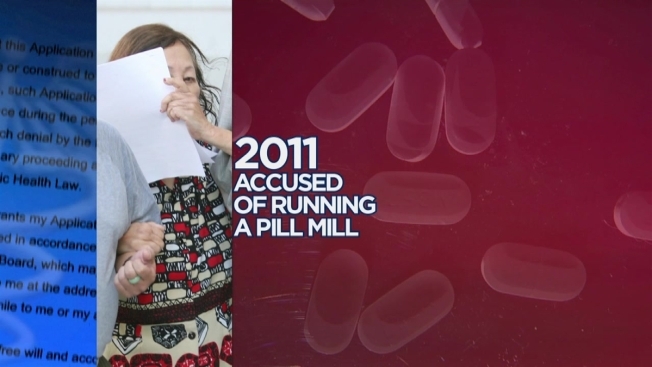 In 2011, New Jersey prosecutors accused Ilem of running a pill mill. She has pleaded guilty to illegal distribution of oxycodone. The I-Team reached out to Ilem and her attorney for comment. Neither responded. Ornstein says Medicare has routinely allowed problem doctors to write Medicare prescriptions while they file appeals or move to new states. He said there was little evidence the Centers for Medicare and Medicaid Services, the agency that administers Medicare Part D, regularly analyzed raw data to identify doctors with unusual or even criminal prescribing patterns. If Medicare had used data to flag Dr. Rohan Wijetilaka, millions of dollars might have been saved. The Yonkers cardiologist was accused of running a pill mill in 2012. According to the complaint against him, pharmacists and patients had complained to Yonkers police more than 30 times about his prescribing habits going back to 2006. Despite that, Medicare paid more than $3 million for Wijetilaka's prescriptions leading up to his arrest. He has pleaded not guilty and is awaiting trial. The I-Team reached out to Wijetilaka and his attorney for comment, neither responded. A spokesman for the Centers for Medicare and Medicaid Services declined comment but pointed out a proposed rule change that would give Medicare new authority to block doctors before misconduct or criminal charges are decided. Josifidis suggested that policy would be unfair. "You would be punishing them without establishing their guilt," he said.